Chattanooga Lookouts third baseman T.J. White (33) hits a home run over the left field wall against the Jackson Generals in the bottom of the fourth inning at AT&T Field on Wednesday, June 7, in Chattanooga, Tenn.
Chattanooga Lookouts pitcher Felix Jorge (46) pitches in the top of the seventh inning against the Jackson Generals at AT&T Field on Wednesday, June 7, in Chattanooga, Tenn.
Talk about the perfect time to peak. 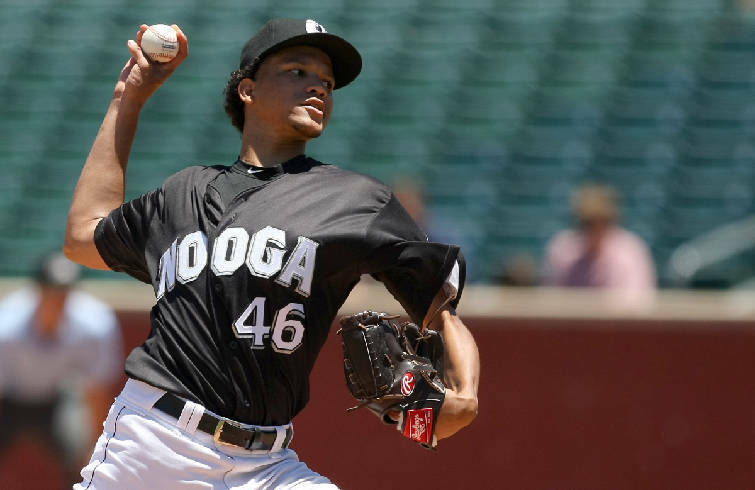 With 10 wins in 11 games to close out the Southern League's first half, the Chattanooga Lookouts not only rolled to the North Division title but posted the league's top overall record at 42-28. Chattanooga trailed both Montgomery and Tennessee within the division before its recent surge that included a 9-1 mark against that duo, with all 10 of those contests coming on the road. 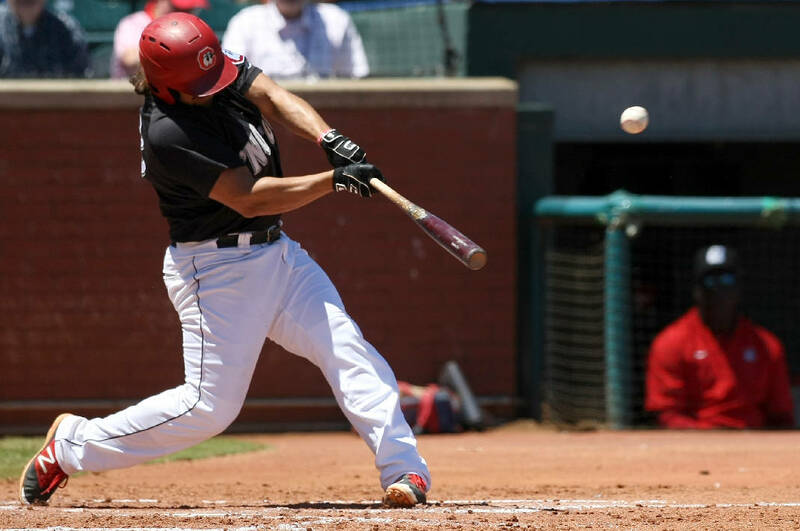 Chattanooga capped the half Sunday afternoon with a 10-2 rout of Tennessee and can enjoy the three-day break that coincides with the Southern League All-Star Game, which takes place tonight in Pensacola, Fla. The Lookouts will push the reset button Thursday night, when they open the second half against Pensacola at AT&T Field. "Our starting pitching really settled in," Lookouts first-year manager Jake Mauer said of the successful half. "Back in early April, we had some difficulties getting our starters through five innings and really setting up our bullpen, which we felt was a strength of ours. Our starters really responded to the challenge and have been doing really well." The Lookouts, incidentally, are 193-154 with a Southern League championship since becoming Class AA affiliates of the Minnesota Twins before the 2015 season. Chattanooga Lookouts pitcher Raul Fernandez (20) gets ready to pitch against the Jackson Generals in the top of the seventh at AT&T Field on Wednesday, June 7, in Chattanooga, Tenn.
Chattanooga had five players nominated to tonight's game: starting pitcher Fernando Romero, relief pitcher John Curtiss, shortstop Nick Gordon, right fielder Edgar Corcino and left fielder LaMonte Wade. That quintet provided a monstrous impact on Chattanooga's first-half success, though there were plenty of others who helped as well. BEST PERFORMER — Gordon entered this season as the top prospect in the Twins organization and has delivered with a .315 batting average that ranks among the top five in the league. He leads the league in hits (85), triples (6) and total bases (136), ranks second in doubles (21) and is third in RBIs (43) and slugging percentage (.504). "He's been very good," Mauer said. "Offensively, he's about where we anticipated. He's got good contact rate and puts the ball in play hard. He's tried to improve his game defensively, and I think we've made some progress there as well." BEST MOMENT — Corcino, who was born in the Dominican Republic, left the team in late May to take his United States citizenship test in Puerto Rico. When he rejoined the Lookouts in Birmingham, he discovered his dressing area in the visiting clubhouse adorned with a U.S. flag along with a stars-and-stripes shirt, hat and sunglasses. "It just created a great vibe around the clubhouse," Wade said of Corcino's quest. "It was really cool." WORST BREAKS — The Lookouts lost three dates at AT&T Field this spring due to rain, including the popular "Star Wars Night," which has been rescheduled for this Saturday. The first-half total home attendance of 106,864 is the lowest at the midway mark since AT&T replaced Engel Stadium in 2000, with Chattanooga's per-game average of 3,340 currently ranking sixth in the league. "It was a weird spring, no doubt about it," Mauer said. "There were a lot of doubleheaders and delays. I'm sure some of the guys wouldn't complain about having to miss some of that pregame work. It is what it is, and most of the teams in our league have fought it." BEST TANDEM — Chattanooga's run to the first-half title occurred despite setbacks on the pitching staff, especially among the top prospects. Chattanooga Lookouts pitcher Felix Jorge fist-bumps catcher Dan Rohlfing after being pulled in the top of the seventh inning against the Jackson Generals at AT&T Field on Wednesday, June 7, in Chattanooga, Tenn.
Starter Kohl Stewart was placed on the disabled list May 8 with knee tendinitis. Reliever Nick Burdi was put on the DL on May 26 with a torn ligament in his elbow, and starter Stephen Gonsalves didn't join the Lookouts out of extended spring until May 20. 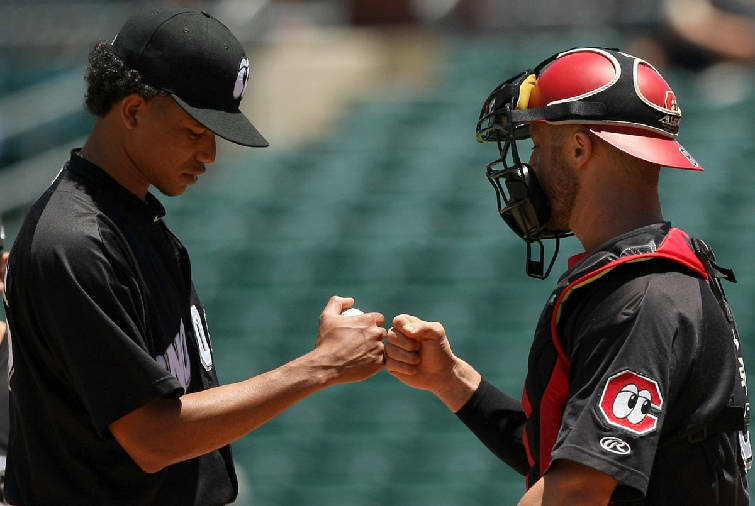 Steadying the ship for the Lookouts have been Romero and Felix Jorge, who combined for 25 first-half starts and a 14-6 record. WORST SNUB — Jorge getting left off the North Division all-star roster with a 5-1 record. He's now 8-1. "He's one of the better starters in our league," Mauer said. BEST ADDITION — T.J. White, who either plays third base or serves as the designated hitter, joined the Lookouts on May 15 and has been shredding opposing pitchers ever since. White is hitting .321 since arriving, which includes a .364 clip this month. BEST STREAK — Curtiss went most of the first half with a zero earned run average and is 13-for-13 in save opportunities. Having appeared in 21 games and having thrown 25 innings, Curtiss is 2-0 with an 0.72 ERA and leads the league in saves. "He's obviously been the most consistent guy out of that bullpen and has pitched some of our biggest innings," Mauer said.